How Can Precision Medicine Help Children With Cancer? A small but significant number of the patients affected by cancer worldwide are children. In the United States, about 16,000 children under the age of 19 are diagnosed with cancer each year, and nearly 2,000 kids die of the disease. The majority of those who survive have an arduous journey ahead of them, dealing with an array of long-term side effects from the toxic anticancer treatments they endured. Precision medicine, a topic often discussed by experts and, more recently, the public—thanks to President Obama’s Precision Medicine Initiative—is an approach to tailor treatments for human diseases based on the characteristics of each individual, as opposed to a one-size-fits-all approach. An important aspect of tailoring treatment for an individual’s disease like cancer, for example, lies in our ability to precisely identify molecular abnormalities that drive that person’s disease. Recent advancements in human genome sequencing technology are making that a reality, and therefore, precision medicine is being more widely applied to treat cancers in the recent years. Major tools for precision medicine are therapeutics developed to target a specific molecular abnormality, known as targeted therapy, which are more precise and less toxic than traditional treatments such as chemotherapy and radiotherapy. Targeted therapies are proving to be a major leap in the cancer treatment arena, which had not witnessed substantial progress for decades. We currently have many FDA-approved molecularly targeted cancer therapies and a robust pipeline of therapeutics under various stages of development and testing, mostly for adult cancers. So, the question is, can precision medicine, which is offering promise and hope to many adults with cancer, be a source of hope to children with cancer? What efforts are being made to integrate technological advancements in treating children’s cancers? What progress has been made so far and what challenges lay ahead? Dr. Kung. Photo courtesy of New York-Presbyterian/Morgan Stanley Children’s Hospital. What is the scope of integrating precision medicine into pediatric oncology? Childhood cancers are generally viewed as a success story because the overall outcomes have improved steadily over the last 50 years. And we have now reached the point where 80 percent of all children with cancer are cured. Despite this success, cancer remains the leading non-accidental cause of death in children. Therefore, one driver for implementing precision medicine in pediatrics is to try to identify targeted therapy options for the 20 percent of patients that are not cured using conventional treatment regimens. We also have the opportunity to improve outcomes for the children that we do cure, since two-thirds of all survivors have some sort of long-term toxicity. It is therefore also our hope to decrease toxicities in the patients that we do cure by identifying targeted therapies directed at tumor-specific alterations that can one day be combined into multi-agent combinatorial regimens. How can the knowledge being gained from using precision medicine in adult cancers be exploited to benefit kids with cancers? Pediatric cancers are thankfully rare, which is a good thing. That said, from a market perspective it is very hard for pharmaceutical companies to justify the development of therapies directed specifically toward pediatric oncology indications. As we understand more precisely what the underlying molecular defects of cancer are using sequencing technologies, we come to learn that, in most cases, the abnormalities in genes and signaling that result in the development of pediatric cancers have similar counterparts in adult cancers. The ability to recognize the similarities allows us to take advantage of therapies that were developed for adult indications and redirect them toward pediatric use. One example of that is the recognition of ALK [anaplastic lymphoma receptor tyrosine kinase] as playing an important role in neuroblastoma, which provides an opportunity to leverage ALK-directed therapeutics developed for lung cancer in adults to treat pediatric patients with neuroblastoma. Similarly, the recognition that BRAF mutations are very common in certain types of pediatric brain tumors allows for the potential application of drugs targeting the BRAF pathway, developed for adult cancers. Read the story of 10-year-old Zach Witt who fought his lymphoma with the targeted lung cancer drug crizotinib. Can you please tell us about the Precision in Pediatric Sequencing (PIPseq) program? We at Columbia University Medical Center and New York-Presbyterian/Morgan Stanley Children’s Hospital have developed a tumor genome sequencing program called PIPseq which allows us to fully molecularly characterize every pediatric oncology patient that we treat. We are sequencing the DNA from tumor and normal tissue and RNA from the tumors. From these genomic data, we’re able to identify mutations, translocations, and copy number variation, and assess gene expression patterns, giving us a wealth of information about the genetic and signaling abnormalities within the cancer. We are actively trying to establish the value of [genomic sequencing] technologies to pave the way for future reimbursement by insurers. Unlike most other existing sequencing programs, we prospectively sequence our patients’ genome at the point of diagnosis using a CLIA-compliant workflow that allows us to provide the treating physicians with results and recommendations within three weeks. Over the 18 months since its inception, we have found that sequencing data has impacted clinical decisions in 65 percent of our patients, which is significantly higher than we had predicted based on published data. Our results underscore the potential clinical impact of genome sequencing, and we are actively trying to establish the value of these technologies to pave the way for future reimbursement by insurers. What measures are being taken to minimize turnaround time and get usable information to clinicians and patients in a reasonable time frame? We have built a highly integrated workflow that involves oncologists, surgeons, pathologists, and geneticists to get everything to the right place at the right time. We have developed an informatics pipeline that can analyze the data in an automated and expedient manner. We have standing multidisciplinary molecular tumor boards to review the data as it comes off in real time to enable interpretation and generation of final reports. Right now, we are able to get results back in weeks, not months, but as a clinician of course I’d like to have that information back in days. Can you give an example of a child who benefited from the program? We have many examples where we have identified actionable mutations and have been able to treat children with targeted therapies that showed clinical efficacy. I think these are examples that everyone is familiar with. But what we have actually found is that sequencing can just as importantly tell us what therapies will not work or are inappropriate for particular patients. An example of that is a young child, a two month-old boy that came to us with hyperinflammatory disease known as hemophagocytic lymphohistiocytosis (HLH). The child had all the hallmarks of familial HLH, the treatment for which would be a bone marrow transplant. When we performed whole genome sequencing of the patient, we were able to discern that the child’s condition was actually not a heritable form of HLH but was due to a mild immune dysregulation. On the basis of this information, instead of putting this child through a potentially morbid, and in this case, inappropriate, bone marrow transplant, we gave him a single course of an anti-inflammatory treatment. The child recovered without a recurrence of HLH. Therefore, the value of genomic sequencing should not just be measured by the ability to identify what to do, but in other cases clinical impact can be measured by avoidance of an ineffective or inappropriate therapy. What efforts are being made by the various centers that run large-scale sequencing programs to share information and maximize usable data output? This is an absolutely critical next step. Multiple national and inter-institutional efforts are underway to develop mechanisms for sharing data, including efforts to develop shared databases. Currently, there are several impediments to open data sharing. These are massive data sets and so they come with many questions: What data can be shared with respect to patient confidentiality? What formats? Raw data or processed data? Where should they be hosted? Who bears the cost of the hosting? Fortunately, these are part of the national discussion, because ultimately we all recognize that the greatest value in this type of approach will come about by understanding the totality of what everybody else has done. The best way to understand an individual’s disease is to understand it in the context of everybody else. Further, we need to find ways to integrate all sequencing data done in the past as a comparative foundation for the sequencing we will do in the future. The best way to understand an individual’s disease is to understand it in the context of everybody else. What are the challenges in moving this field forward and making progress for children with cancer? In our efforts to transition sequencing technology from a research endeavor to a clinical test, we have faced challenges in improving throughput and bandwidth. We have reached the point where the sequencing is the easy part. Many of our current challenges lie in how we analyze the data and how to standardize methods such that the data are reproducible from center to center. A major challenge is that as a clinical test, ultimately these approaches must be reimbursed. It is time that we as a community together demonstrate the impact and the value of precision medicine so the existing hurdles can be addressed. In pediatrics, we have discovered a previously unappreciated hurdle. Even when we identify a targeted therapy that we recommend on the basis of the sequencing results, there are still many impediments to actually getting that drug for the child. In many cases, insurance companies won’t cover a drug in a pediatric patient because there’s not a specific pediatric indication. In many instances a lot of time is spent appealing decisions, seeking compassionate use and writing single-patient INDs [investigational new drug application submitted to the FDA] to be able to get the drug. We have determined that on average, it takes about 40 hours’ worth of work over a period of four to six weeks to ultimately get a drug to a patient. So, even as we try to be more efficient in getting the test results back to clinicians, quite often, the back end becomes the real hurdle to getting drugs to patients. I think the national landscape is rapidly changing. The importance of precision medicine is underscored by the NCI-MATCH program in which patients are directed to clinical trials on the basis of underlying molecular drivers. The pediatric MATCH is currently under development. It is time that we as a community together demonstrate the impact and the value of precision medicine so the existing hurdles can be addressed, because precision medicine is poised to make a huge difference in the lives of cancer patients, old and young. 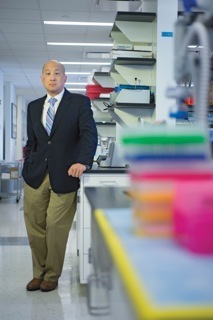 Andrew Kung, MD, PhD, is professor of pediatrics and chief of the Division of Pediatric Hematology, Oncology, and Stem Cell Transplantation at New York-Presbyterian/Morgan Stanley Children’s Hospital and Columbia University Medical Center. In this role, he oversees the clinical and research programs of the division, with the goal of providing exceptional care for young patients today while speeding the development of the next generation of therapies for children in the future. Kung has been an AACR member since 1998. Read his full bio. ← How Should DCIS Be Treated?